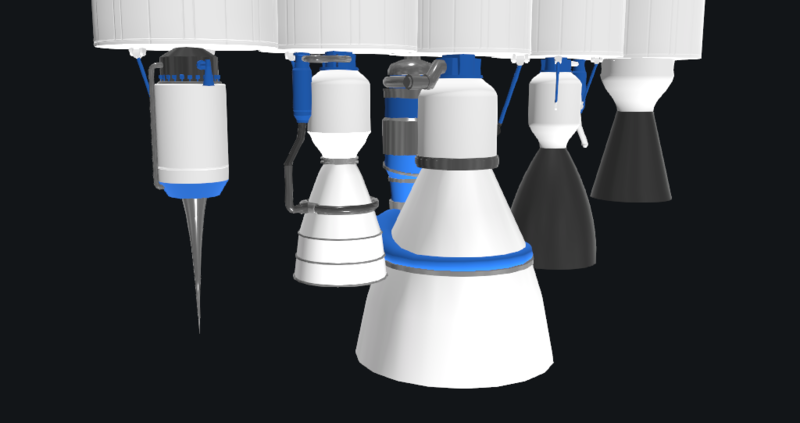 Eight new engine types, seven new nozzles, and six new fuel types are available which allows for hundreds of possible rocket engine configurations. They also have slider options for size, nozzle length, throat radius, and chamber pressure so really there are infinite possible configurations. The new Performance Analyzer window in the designer will give you immediate feedback. You can see how their performance characteristics change with altitude as you tweak the rocket engine's parameters. This update also brings a lot of improvements and bug fixes for building airplanes. 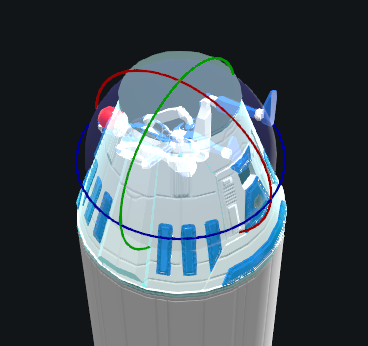 There is now a plane/rocket building mode option available on the command pod and a new visualization tool to help visualize your craft's direction of travel. New Fuel Types: Hydrolox, Methalox, Kerolox, Liquid Hydrogen, Water, and Solid rocket fuel. Engine exhaust plume now supports under-expansion and over-expansion. 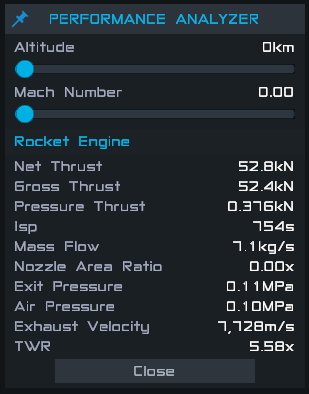 Added new Performance Analysis window to designer for jet engines and new rocket engines. Added build mode so you can now switch between rocket building and plane building. You can find this under your command pod's part properties. Added ability to invert the airfoil of wings. Display which input a control surface is assigned to when it uses Auto. Added ability to restrict a auto-configured control surface to a single axis. Added button in designer to show wing lift vectors. Activation Group Replication - When you have a craft with multiple command pods you can enable this option on a command pod to replicate the primary command pod's activation group states. Docking ports can be disabled to prevent docking. Disabling while docked will undock the ports. Added flight scene camera speed and sensitivity settings. New engines are not yet textured and they don't have new sound effects yet. We are working on it. We are looking for feedback on the new rocket engines. We've spent a lot of time trying to make them as accurate as possible. Let us know if you have any feedback on their performance or visuals. @Gregrox Current water NTRs are still very beneficial as water is very dense. @AndrewGarrison Wow, it cut off exactly two letters. What luck. I can't see any advantage to using waterlogged NTRs unless the thrust is increased. For gameplay reasons the whole point of using water in an NTR is getting that increased thrust. I think it's necessary from a gameplay standpoint. The same NTR design should have the same thrust power regardless of what's being pumped through it, because that's defined by the temperature and size of the reactor. This may be different among chemical engines, where it would make sense to keep the chamber pressure the same and vary other things (what with different fuels burning at different temperatures), but in an NTR the power is defined by the reactor itself, which is a constant between two NTRs that are otherwise identical. As far as I can tell, having the waterlogged NTR have the same thrust as the Hydrogen NTR would imply that the thrust power is in fact lower, which shouldn't be the case for an NTR as opposed to a chemical rocket. @AndrewGarrison Oh so the chamber pressure is a constant! In reality the thrust power would be a constant as the two different propellants share the same nuclear reactor (this the same thrust power). But I guess this approach could work too. @Gregrox Thank you for the clarification. I'm afraid that our comment character limit may have cut off some of your comment. Sorry about that! It is a really interesting way to compare the engine types. You would be correct that it would violate the laws of thermodynamics if we claimed both engines had the same power, but they clearly do not. Looking at the Thrust Power equation, I don't see how mdot could be constant between the two. If Isp and Ve decrease then mdot would need to increase to give equivalent power. The player can increase mdot by increasing the throat radius of the engine and/or increasing chamber pressure. We are approaching things a bit differently. Instead of holding power constant between fuel types, we hold chamber pressure constant and calculate everything else from that. This allows us to calculate exit pressure dynamically from their nozzle parameters (edit: and update Isp) as the player moves through an atmosphere. @AndrewGarrison Heavier molecular weights will actually result in a higher thrust proportional to the decrease in specific impulse for the same mass flow rate and thrust power. Since the temperature of an NTR reactor is the same as the temperature of the combustion chamber in a hydrolox rocket, and the exhaust products are exactly identical (H2 and O2, the water is torn apart by the NTR), and the turbopumps should be the same, the performance of a water NTR and a Hydrolox rocket should be identical. P = Thrust power. T = Thrust. Ve = Exhaust Velocity. The temperature of the reactor is essentially proportional to the thrust power and does not change depending upon the propellant in an NTR. So therefore if you decrease the specific impulse (exhaust velocity) you need to increase the thrust to keep the same thrust power. "This means, given an NTR and a combustion rocket of similar sizes and similar temperatures, the total power is roughly the same. And if we assume the exhaust velocity of the NTR is roughly twice that of the combustion rocket, the thrust of the NTR must be roughly half that of the combustion rocket. By extension, if the NTR has the same exhaust velocity as the combustion rocket, then the thrust must be the same." T = Thrust. M_dot = Mass flow rate. Ve = Exhaust velocity. Assuming a constant mass flow rate, since we're using about the same pumps in both engines, the thrust and specific impulse are inversely proportional. "Essentially, this means the biggest advantage of NTRs, their high exhaust velocity, is the root cause of their lower thrust. Additionally, NTRs which do not have this advantage, the high exhaust velocities, have comparable thrust as combustion rockets!" As I understand it, though of this I am not certain, it would break the laws of thermodynamics for this thrust-thrustpower-efficiency rule to not work the way it does. @Gregrox The molecular weight is higher for H2O vs LH2, which results in higher mass flow, but slower exhaust velocity and gives about the same thrust between the two propellants. Without changing chamber pressure or the throat radius it doesn't affect thrust. Water does have the advantage of much higher density impulse. We had some more discussion about this on your suggestion post. Let me know if you find any flaws in my thinking. I appreciate your feedback. The ability to invert aerofoils should be on SP too tbh. @pedro16797 what is a SERN? Why you aren't made a spin detonation type of your procedural engine? I wanted this very strong, but you aren't made! Why? I think the jet engine in V0.7.0.0 could be further improved. 3. The third slider to adjust burner temperature-an important parameter affecting total thrust and fuel consumption, ranging from 1,000 K to 2,300 K.
4. Add stator blades behind the fan. The core engine of a high bypass fan seems floating in midair in current version, which is odd. The engines and analysis are awesome and highly fulfilling, great work. I suspect you’ll work on news sounds for them, but I have a good idea on inhancimg realism: as the atmosphere thinns, change the exhaust to behave differently. This is seen on rocket launches when they reach high altitudes, the pressure drops so the exaust widens. @LiamW wait till the beta is over. Well now we need Scott Manley to do a second review. The NTR doesn't seem to have increased thrust in water propellant mode. It should have a thrust increased inversely proportional to the decreased specific impulse. @Pejayous if you are on steam, click the game properties in your game library. The last tab says beta. You can get the update after you accept there.